Located close to Aina Mahal, this 19th century palace do deserves a visit because of its unique architectural design. History says, that the palace was named after Rao Pragmaji I, who commissioned the construction of this palace in the year 1865. From the outside appearance, the palace looks slightly out of the place. But it’s Italian Gothic architectural style still manages to grab eyeballs of the visitors who come to visit Aina Mahal. Step inside the courtyard and you will come across a small Hindu temple. The interior of the palace starts with a Durbar Hall that is filled with antique wall hangings, paintings, furniture and chandeliers. The entire hall has a very classy look. Move inside and you will come across many rooms stuffed with more antique pieces. The primary highlight of the palace is the Bell tower. Climb up the spiral staircase of the bell tower to reach the top floor. From this floor, you can enjoy a beautiful scenic view of the entire Bhuj city. Though the palace has faced few damages during Gujarat earthquake, its ancient beauty is simple un-ignorable. How popular is Prag Mahal Palace? People normally club together Rann Utsav and Hill Garden while planning their visit to Prag Mahal Palace. Everything the the royals have discarded has been kept here for us to see. Most of the stuff is gathering dust. It's ok. Nothing to rave about. The only thing that is memorable is the view from atop the clock tower. The claustrophobic stairs up to that though were a bit of a scare. Imagine a thin spiral staircase way up... meant for a single person...but instead we had people going both up and down at the same time ... getting stuck, not knowing how to manage in that precarious scenario. People helped each other though. But it was a bit scary. The earthquake damage can be witnessed first hand though. They are trying to restore the monument. 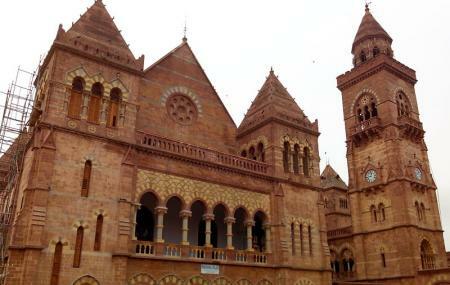 If you have seen palaces in Rajasthan, you may not like Pragmahal palace Afternoon is the worst time to visit this palace. It's too heated and non of the fans here actually work. Architecture wise it's more prettier on outside than its interior. Great palace with a glorious history. Beautifully built and maintained. I can make anyone wonder how they made such a timeless architecture at that time. Mostly crowded on weekends and timings are also strict. One should definitely bring their younger Tod's and let them Know the glory of such kingdoms. Felt proud being here. Good place to re-visit history, to my surprise there were guides inside every section who will provide you more information of you are interested in knowing more about the history. BTW structure is okay maintained and there is room for improvement.